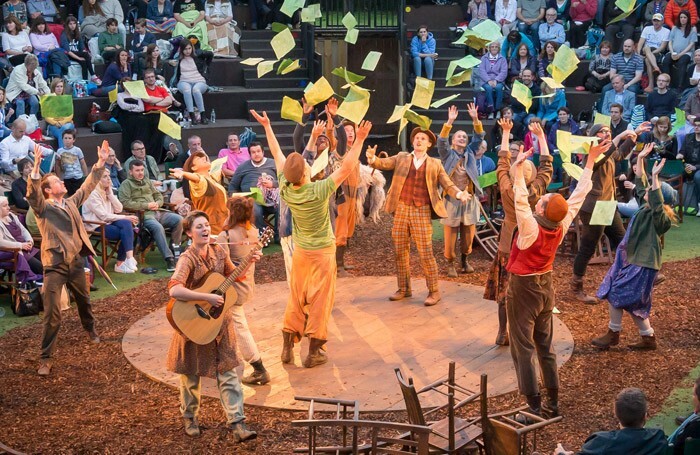 As You Like It often feels like a jigsaw of a play and some of the plot points are so implausible that they defy common sense. Director Philip Wilson makes light work of ignoring the unlikely and uses a strong sense of wonder and a keen eye for comedy to suspend the audience’s disbelief. Rapid scene changes are aided by designer Jess Curtis’ use of assorted bric-a-brac and a job lot of chairs to move things deftly from the gentrified world of Duke Frederick to the clearings of the forest. Theatrical sleight of hand allows Ian Harris to transform from Frederick to Duke Senior with cunning distractions taking our eye off the ball as he changes costume in plain sight. The doubling of other characters between the two worlds is handled with clarity. Rose O’Loughlin carries the production with her deeply sympathetic portrayal of Rosalind, and she’s given a great sounding board in Charlotte Miranda-Smith’s splendidly exasperated Celia. Fred Lancaster’s Orlando is full of charm and he has the crowd cheering him on as he beats Harry Livingstone’s wrestler, Charles, angering Robert Willoughby’s dastardly Oliver. Touchstone gains a dual personality when Ben Tolley produces a hand-puppet and ramps up the comedy. The ending transports us to a magical forest glade for multiple weddings, accompanied by John Nicholls’ onstage music and the offstage birdsong in the park, as the evening draws on.